Win-win deal: Construction workers at a site near the KL Sentral in Kuala Lumpur. OSK Research says the latest land deal will enable MRCB to expand its KL Sentral development projects. 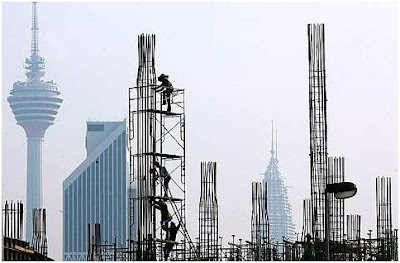 PETALING JAYA: Malaysian Resources Corp Bhd (MRCB) struck a good deal, getting two plots of land in return for constructing several public infrastructure projects in Brickfields. OSK Research in a note yesterday said that it was not entirely surprised by the news given that MRCB had previously indicated that it had targeted several parcels of prime land in Klang Valley, including Brickfields for potential land acquisition. “We view the agreement positively as it's in line with MRCB's strategy to boost its land bank and given that the exchanged land is located near its existing developments in KL Sentral,” it said. It believes that the latest development will enable the group to expand its KL Sentral development projects. To recap, on July 5, Country Annexe Sdn Bhd (CASB), a 70%-subsidiary of MRCB, would be given land in Kuala Lumpur with an estimated gross development value of RM1bil for undertaking three projects in the city's Brickfields area. MRCB told Bursa Malaysia that CASB had entered into a privatisation agreement with the Government and Syarikat Tanah dan Harta Sdn Bhd for the construction of three projects in Kuala Lumpur. The projects consist of Little India (upgrading and beautification of Jalan Tun Sambanthan, Brickfields), Pines Bazaar (a three-storey building consisting of office space, 28 units of stalls and 140 carpark bays) and Ang Seng Development (212 units of new government Class F quarters near Jalan Ang Seng to replace the quarters at Jalan Rozario). DMIA Sdn Bhd owns the remaining 30% stake in CASB, which was set up as a special-purpose vehicle to develop the projects in return for two pieces of land at the intersection of Lorong Chan Ah Tong and Jalan Tun Sambanthan. The 214,630 sq ft land is valued at RM601 per sq ft or RM129mil. MRCB said a proposed mixed property development on the land represented a good investment opportunity to further strengthen the group's income in future. Attempt to get comments from MRCB was unfruitful yesterday after it told StarBiz that its chief executive officer Datuk Mohamed Razeek Hussain was currently in overseas. In June last year, the RM36.6mil Little India project was jointly awarded to MRCB and DMIA by the Government on a design, build, finance and transfer basis. It was completed last October. PETALING JAYA: Property firm Bolton Bhd's placement of 21% of its shares on Tuesday to local and foreign funds, including to the company's major shareholders, should remove share overhang and help narrow the company's large discount to its real net asset value of 62%. In a report, Hwang DBS said it was positive on the share-placement exercise because of this. Bolton's large discount to RNAV stood at 62% versus the RNAV of other small mid-cap developers which was at an average of 50%, the research house said yesterday. The company declined to comment who the buyers and sellers of the shares were when contacted. The off-market deals, 13 in all, were done at RM1 per share, according to information on Bursa Malaysia. According to Bolton's 2010 annual report, executive chairman Datuk Mohamed Azman Yahya held a 18.8% stake in the company via Gajahrimau Capital Sdn Bhd while Lee Choong Lim @ Lee Ting Fook had a 23.52% stake via Forum Equity Sdn Bhd as at mid-year last year. Recent filings with Bursa Malaysia revealed that Lim Hooi Teik, a substantial shareholder of the company, raised his direct and indirect stake to 9.47% from 8.93% earlier in the year. At the close yesterday, Bolton shares finished 5 sen higher at RM1.08. The Indian Property Investment Fair will be held on August 20 and 21 at the Mid Valley Megamall in Kuala Lumpur. The exhibition will feature properties that vary from vacant lands, apartments, villas, and houses for sale to investors and developers in Malaysia. It will also showcase various projects for sale at South Indian Properties at Chennai, Madurai, Tirchi, Coimbatore, Ooty, Yelagiri, Kodaikanal and Tiruvannamalai.